You can often read that the onion is being called “the king of vegetables”. This flavorful vegetable is used in probably every cuisine worldwide. It also has many unique healing and antiseptic properties. Onions are rich in vitamins A, B and C, calcium, magnesium and iron. If you eat the onion raw, you will be stimulating your liver function, and if you eat it cooked, it can help relieve constipation and flatulence. Even its skin has medicinal properties – boiled onions skin tea can help eliminate unpleasant diarrhea. 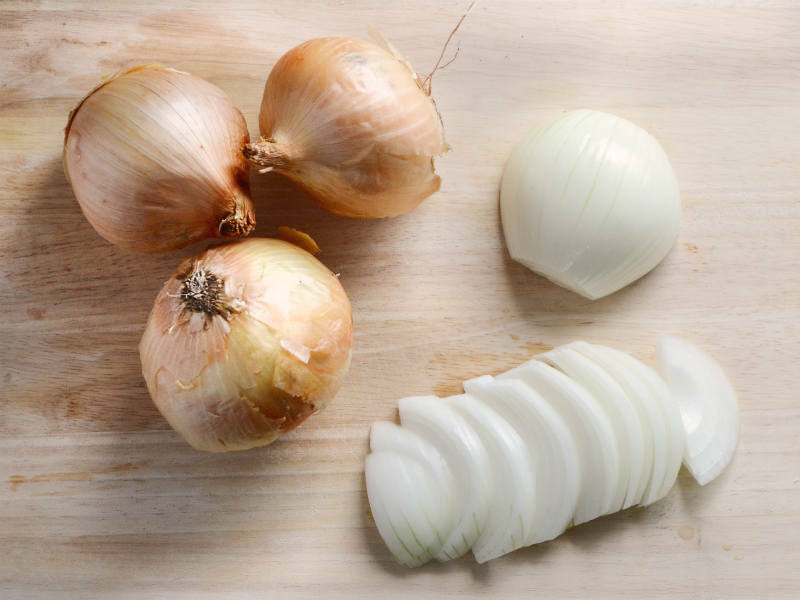 Because raw onion is a powerful antiseptic, it fights against pathogenic bacteria, such as E. coli or Salmonella. Consuming raw onions increases blood circulation and causes sweating, which is very beneficial in cold and dump weather, during flu season or if you catch the common cold. Onions ward off infections, bring down fevers, and sweat out colds and flu. Onions have strong detoxifying properties, which makes them an excellent weapon of choice for a full body detoxification. If you eat only as much as half an onion a day, you will significantly improve the results of your LDL cholesterol levels, which can prevent coronary disease and heart attack. Onions have diuretic properties which makes them extremely helpful with water retention problems. Freshly processed onion juice is a great sure for sore throat, sinusitis and breaking up mucus congestion. Eating onions will improve your overall health and relieve fatigue and lack of energy. Advice: Always make sure you pick firm globes with regular shape when buying onions. If its skin looks withered or the onion feels soft, don’t buy it. Also, if there are green sprouts on the top, the onion has probably stayed on the shelf for too long and is past its best. Thank you, I learned much. God Bless.